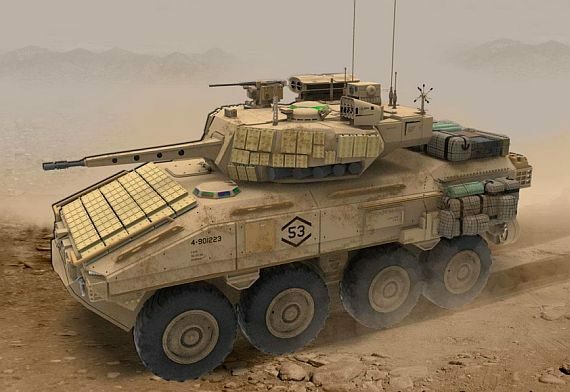 U.S. military researchers are asking Science Applications International Corp. (SAIC) in Reston, Va., to build a prototype reconnaissance armored combat vehicle to enable U.S. Marine Corps battlefield reconnaissance units to fight through the enemy to gather and disseminate crucial intelligence information from the battle front. Officials of the U.S. Office of Naval Research in Arlington, Va., announced a $19 million contract to SAIC on Thursday for a portion of the Armed Reconnaissance Vehicle (ARV) program that involves advanced high-risk technology development called "at the edge." The future ARV will be able to fight for information on a complex and contested battlefield using an automatic rapid-fire medium-caliber cannon, remotely operated medium-caliber machine gun, and open-architecture advanced vetronics to include sensors, communications, and battlefield networking. The project seeks to build two ARV variants -- a base model and an at-the-edge model -- to evaluate technologies, performance, and battlefield concepts. Contractors will build two demonstrators of each variant. SAIC has been selected for the at-the-edge model. Other contractors will handle the base variant. SAIC engineers will develop an at-the-edge ARV demonstrator with relatively high-risk technologies -- some of which could have limited operability with development paths that would lead to full capability. This demonstrator is to push the upper limits of capability and performance. The at-the-edge variant that SAIC will build will be operational, but isn't supposed to have the durability necessary to withstand sustained operations on the battlefield. It is to demonstrate enabling technologies at technology readiness level 5, which seeks to validate components in a simulated or real environment. SAIC's at-the-edge demonstrator will push the limits of combat vehicle enabling electronic technologies such as a self-healing cyber-safe electrical and data distribution architecture; and power generation for all on-board systems with a 25 percent power buffer, with support for 100 percent power growth within 10 years for power and distribution, data distribution and processing, and memory storage. Other electronics that SAIC engineers will address in this project are communications with technology refresh updates every four years that supports secure voice, video, and data exchanges in GPS-denied environments; interfaces to launch, control, retrieve, and recharge unmanned aerial vehicles (UAVs) and unmanned ground vehicles (UGVs); modular electronic architectures to support insertion of emerging technologies and multi-mission payloads; and manned and unmanned teaming operations with robotics and autonomy. Wow! The USMC is tossing SAIC a HUGE BONE with this project. They will have not only a bird's eye view of what the USMC is looking for but at worst they'll probably be asked to partner with a contractor that actually looks to build these rigs (assuming they don't want to do it themselves). No offense but General Dynamics and BAE are larger concerns with a proven track record and vast experience in this field. Going to SAIC seems like a reach but let's see what they can do with the thing.